Yes, this is how I feel. Actually, I felt more like that, oh, about three days ago. There are still lingering effects but am recovering. There is too much clutter in my life. Way too much. Likely, this has something to do with traveling so much of late. Since January 5 I have raced through ten different airports - a few of them multiple times - slept in five different states and nine different hotel chains, (slept in my own bed only six nights), and eaten in more restaurants, good and bad, than you can shake a stick at. Might be one reason for the clutter in my head - and for the reason I've come down with a good case of flu-like symptoms, fever and chills and the like - and a severe case of brain exhaustion. Not to mention that I have feather allergies. Ever try sleeping in a hotel bed with down pillows and comforter when you have feather allergies? No matter if you ask the hotel to remove said offending items, the residuals are still there. Duck dander, or something. Puffy, water eyes and after a while, you're sick. But back to the cluttered-life-and-brain thing. There is an official word for it: Neurocranialdeclutterorbust syndrome. Simply put, either declutter your brain or end up busting your head upside a brick wall repeatedly until the clutter is out. I'm there. About to bust my brain against the wall. Need proof? Well then, here you go. How about the tax mess on my kitchen table? 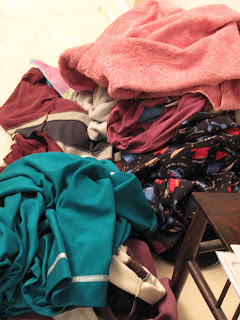 Or the laundry pile on my bathroom floor? Or the mail tossed aside on my short stays at home? Or the home office reorg that never got off the ground? And I won't even mention the day job backlog of email, projects run amok, and phone calls to return. See, I told you. Neurocranialdeclutterorbust Syndrome. So what to do about it? Bust my brain against the bricks or take action and simplify? Or, perhaps, let the brain veg for a couple of days and then take action. (some days I suffer from Scarlett O'Hara syndrome, too. You know, I'll think about that tomorrow...Hm, does this contribute to the clutter? Surely not...). Anyway, sounds like a plan. Veg first, action tomorrow. Brain exhaustion and flu symptoms do require rest, yes? So let's pick this discussion back up in the morning, 'kay? I'm pondering some decluttering ideas and a few life simplication techniques. Close eyes, ignore, move on. I'm sitting here at laptop reading your blog, doing anything to keep from doing what's on my list. So...how do you spell that syndrome again? Maddie, what you have appears to be chronic among writers. I've been trying (sporadically) for a couple of months to declutter. So, I do one room--the easiest, of course--then move on to the next. What happens? I end up transferring the clutter from one room to the other. No real progress there. Today, it's all staring me in the face again. Even the spots that were decluttered have filled back up. It's a vicious cycle. My dream lately is to move to a bigger house with about a hundred closets. Wonder if that would solve the problem. Probably not. I think some of us are born with a clutter gene. Oh, and Jennifer, You, too? Well, that proves it. Wow!!! I thought our tax pile was bad. You know what? 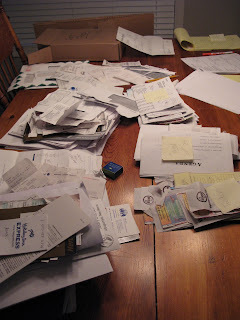 Scoop everything up in a folder and take it to an accountant. That's what we did, and it was well worth the $200 or $300 bucks. I've vowed that this year I AM going to keep everything together. 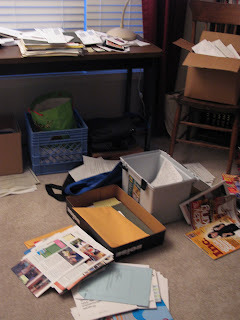 Getting ready for this years taxes has already de-cluttered my office area, so if I can just keep organized with what comes in, I should be ready next year. Right? Don't laugh! Hmmm...let's see- my laundry grows a new head every time I think I've knocked a dent in it. I've got baby dust bunnies gathering around...I knew I shouldn't have let the males and females live together. 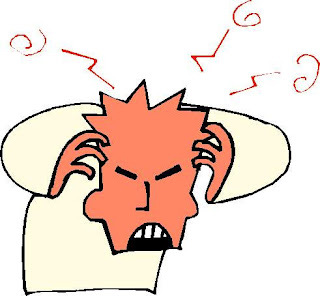 I've got kid troubles though on top of it and it doesn't seem to be letting up and it's eating away at my brain- meaning I've not gotten ANYTHING done today between laundry and emailing back and forth with my stepson's teacher trying to figure out what's going on with him. A nice leisurely bubble bath by candlelight sounds REALLY good right about now! Taryn. That's the ticket. Bubbles here I come. Hm, going back to Mia's suggestion earlier in the day: Close eyes, ignore, move on...to bubbles! Maddie and everyone, I wonder if there is a 12-step program for Neurocranialdeclutterorbust Syndrome. Has anybody googled that? If I come visit you don't you dare pick anything up, or even attempt to clean house. I won't feel as at home if you do. 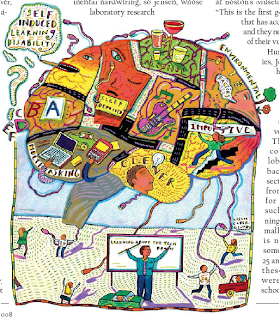 As for the brain clutter--Yeah, Yep, Know all about that, too. In fact I think I'm growing woozy, and what's that spilling out of my ear? Hey Madz! I have an idea. Quit the day job, come live with me and write (Oh, and free food!) The catch? Must wear those "dusting" house shoes, put your dishes in the dishwasher (no scraping needed-I love my dishwasher! 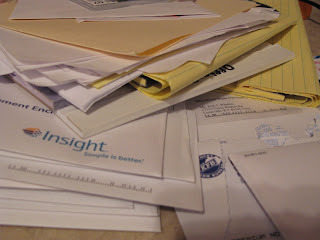 ), keep the cat from killing me or disappear the cat (can't decide), find my travel receipts to put in a pile, make a space to pile my dirty clothes, and retrieve the mail from our psycho mailman. Easy peasy! Hey, I can do that! I mean, after picked up after kids and men most of my life, how difficult could it be to keep up with one publisher and a cat and a mailman? You got it!